For the past several months, the Rachofsky Quadrant Gallery on the Museum’s first level has been occupied by seven large paintings spanning half the gallery, nearly floor to ceiling. 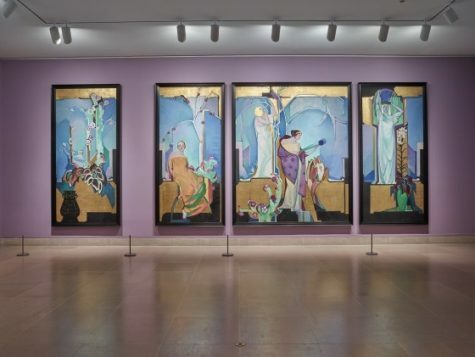 Installed on a lilac-colored wall, the framed canvases contain figures posed with flowers, rendered in eye-catching pastel hues, and surrounded by alternating sections of black and gold leaf. 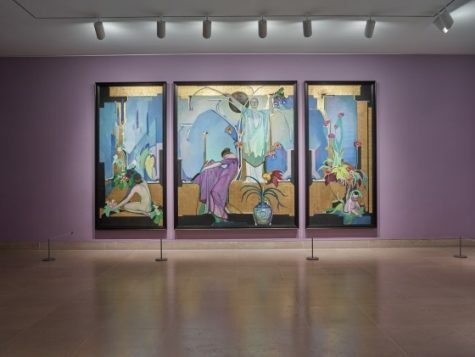 These paintings are Edward Steichen’s In Exaltation of Flowers, a commissioned series that the artist completed in 1914 for the home of New York financier Eugene Meyer and his wife, Agnes. Never installed in the space for which they were created, the majority of the panels were kept in storage for the past century. 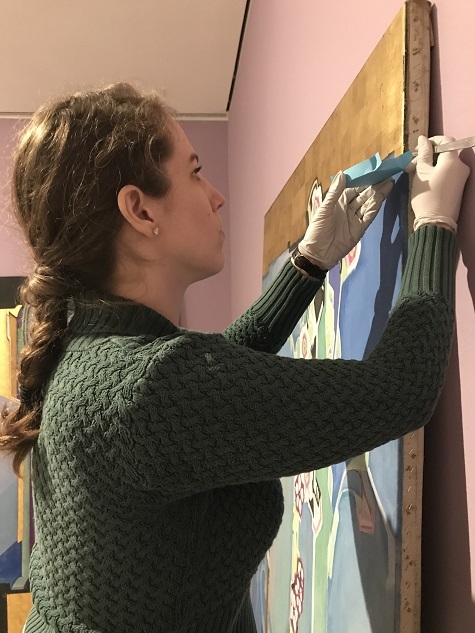 Last summer, the DMA’s conservation team unrolled the canvases, stretched and framed them, and completed conservation treatment so the series could go on tour. Newly conserved and reunited in one exhibition, In Exaltation of Flowers is a time capsule of Edward Steichen’s life and the lives of his close friends on the eve of World War I. On Thursday, April 26, from 6:00 to 8:00 p.m., we will say goodbye to In Exaltation of Flowers with a soiree that will include a complimentary reception with drinks and small bites inspired by the paintings, a tour about flower symbolism with Dallas Arboretum VP of Gardens Dave Forehand, and a talk by art historian Dr. Jessica Murphy. Edward Steichen was an avid gardener who exhibited his celebrated delphiniums in New York’s Museum of Modern Art. For Steichen and much of society at this time, flowers were more than just beautiful objects; they took on human character traits and the giving or receiving of flowers served as a kind of subtle language. 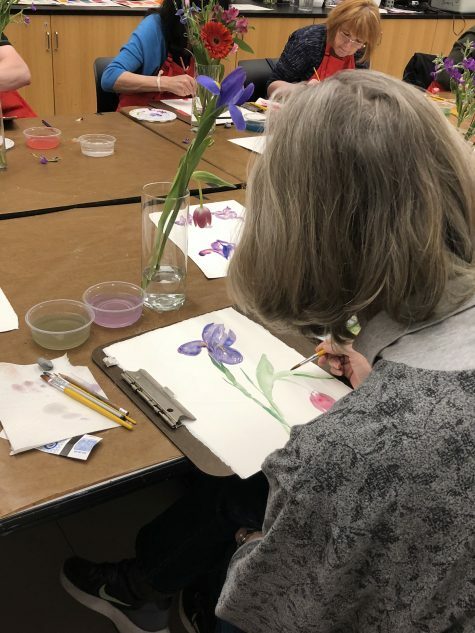 Each of the sitters for In Exaltation of Flowers is paired with specific flowers that relate to their personalities or the nicknames given to them within their friend group. 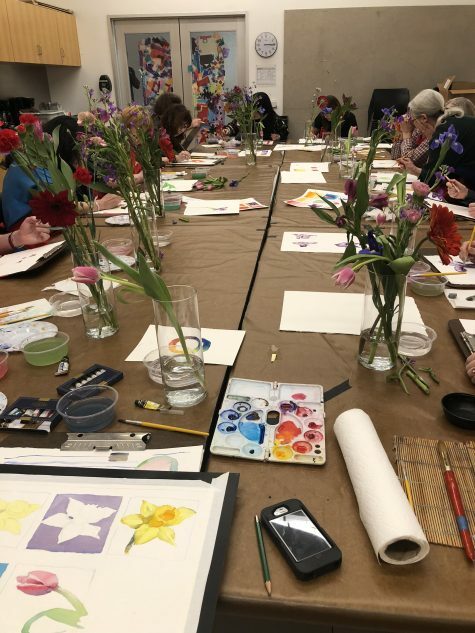 Join Dave Forehand of the Dallas Arboretum for a tour of In Exaltation of Flowers focusing on the types of flowers Steichen included in his paintings and what they might have communicated to a viewer in 1914. In Exaltation of Flowers captures a very particular moment in Edward Steichen’s career, in the history of art, and in the lives of a circle of friends on the eve of the World War I. A very personal project for the artist, the murals include portraits of close friends, either painted from life or from photographs, alongside flowers inspired by his garden at the French country home where he hosted lively parties. Steichen’s careful portrayal of his subjects reveals the nuances of their personalities and relationships within the social group. Best remembered as a photographer, Steichen had a somewhat rocky relationship with painting and ultimately destroyed much of his painted work. His approach to this series shows a nod toward the Symbolist movement, with its emphasis on flatness, invariable color, and in some sections abandonment of realism. 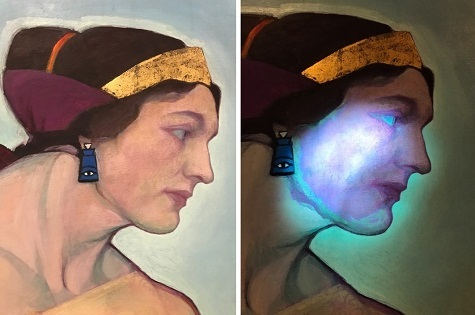 Jessica Murphy, Brooklyn Museum’s Manager of Digital Engagement, will bring to life these and other stories behind Edward Steichen’s murals and the people who inspired them. Don’t miss your chance to spend an evening in 1914 with Edward Steichen and his closest friends before In Exaltation of Flowers leaves the DMA in early May. For more information, visit DMA.org or click here to purchase a $5 ticket. 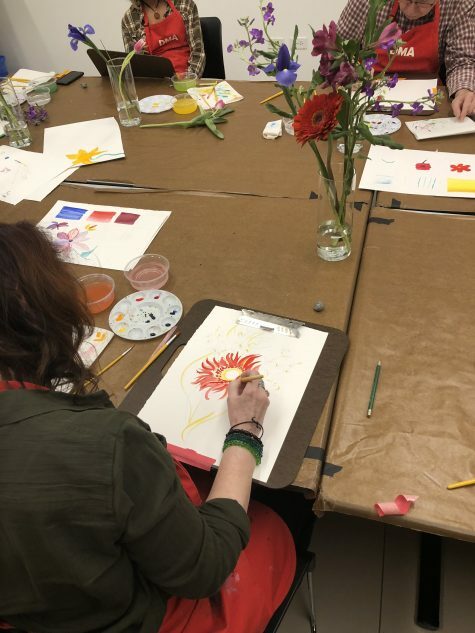 Edward Steichen: In Exaltation of Flowers is in bloom until May 13, so while we still have these colorful, one-of-a-kind murals on our walls, we hosted a workshop all about florals. The program began with a tour in the exhibition where the group learned more about Steichen’s social scene and the friends that he immortalized in this artwork. Participants saw how Steichen used flowers as symbols for the different people in the murals and how his passion for horticulture lent itself to extremely realistic depictions. After the tour, everyone chose their own flowers to create their personal still life. 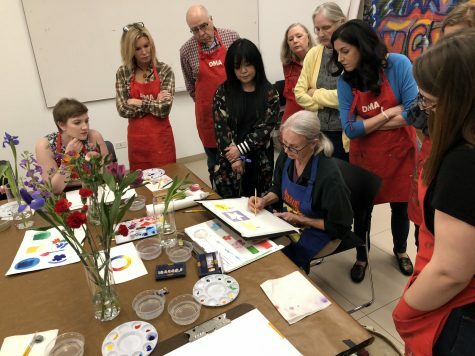 The group then learned watercolor techniques from local artist Carol Ivey, who paints minutely detailed still lifes. 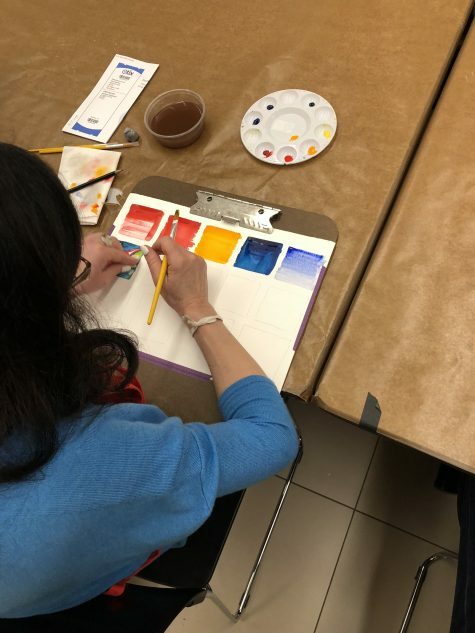 By the end of the workshop, everyone had bloomed into new watercolor painters and departed with their finished work and brushes to continue practicing. 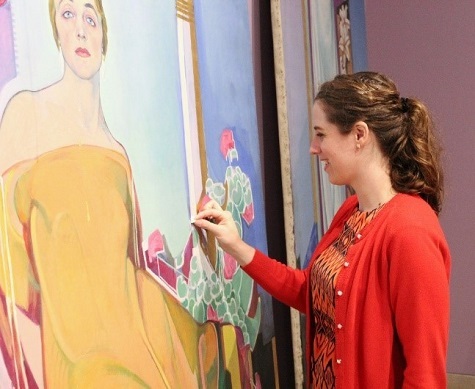 If you missed the workshop but want to learn more about Edward Steichen, his murals, and his love of flowers, join us on Thursday, April 26, at 7:00 p.m. for an exhibition talk by Jessica Murphy, Manager of Digital Engagement, Brooklyn Museum. If you’ve walked through the Barrel Gallery recently, you might have seen some conservators crawling around. Whether on the floor or on the ladder, the monumental size of Steichen’s mural series, In Exaltation of Flowers, has required some minor acrobatics. The team recently finished the cleaning phase of the treatment process – an essential step to protect the paintings from further degradation and ensure they can be enjoyed to the full extent that their beauty merits. Cleaning huge paintings with tiny sponges. You may recall from the short history of the murals that was recently posted that the canvases have been rolled up for over a century. During that time they encountered water damage, dust, dirt, grime, and other indignities that can be found in a storage room. 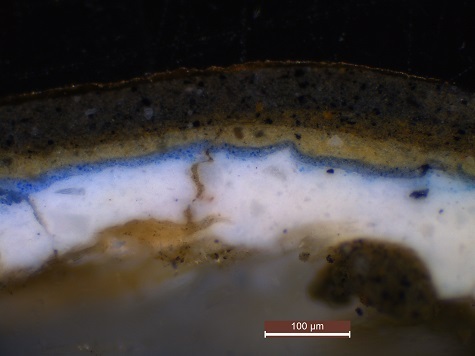 This left the paintings with a significant amount of dust and dirt on their surfaces, which dulled the colors and deadened the sheen of the paint. To remove this disfiguring accumulation, we used special non-abrasive sponges to gently dry clean the surface and reveal the surprisingly fresh surface the paintings still exhibit. In areas of drips from water damage, tiny hand-rolled cotton swabs and a gentle chelating solution were employed. After cleaning, the paintings were brighter, more even, and much closer to the appearance Steichen intended them to have. The next phase of treatment includes loss compensation, framing, and preventive measures like backing boards. We’ll describe these processes next week. If you have wandered past the Barrel Vault Quadrant Galleries during the initial stages of the Edward Steichen: In Exaltation of Flowers conservation project, you likely saw a lot of beige—new stretchers, plain cotton-duck fabric, and backsides of paintings—and five women hammering, measuring, and stapling away. A handful of visitors have asked us what we are doing or if we are the artists, so we thought we should explain a bit about the initial and necessary steps in the conservation of these magnificent murals. While the most glamorous parts of conservation treatments are usually the final steps like inpainting and varnishing, the beginning of a project often includes a lot of preparatory work and a healthy amount of elbow grease, and it is just as important that we are precise in these first stages of treatment as we are in the final steps. The seven large paintings that make up Steichen’s In Exaltation of Flowers were commissioned by Agnes and Eugene Meyer for their townhouse in Manhattan. Due to financial difficulties, however, the murals were never hung in their intended environment (read more of the history here). The paintings were shown as a set only once, in 1915 at the Knoedler Gallery in New York City, and have not been shown in a series since. Records indicate that two or three of the paintings were shown individually in exhibitions between 1915 and the present, and one painting arrived at the DMA already stretched. Aside from this, the paintings were stored rolled before coming to the DMA, accumulating dirt and dust for over 100 years. 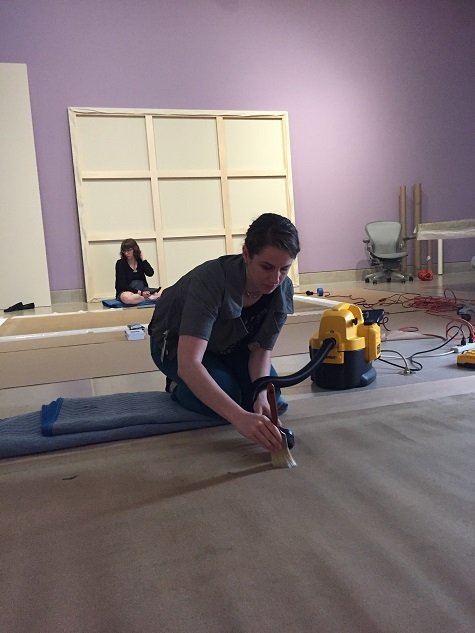 Keara Teeter using a soft brush and vacuum attachment to remove dirt and dust from the reverse of a painting. In order to help remove a century’s worth of grime, we vacuumed the reverse sides of each unstretched painting. This process is likely not what you are picturing; we don’t take the Dyson out of the closet and roll it over the canvas, wheels and all. Instead, we use a soft-bristle brush to sweep particulates into a vacuum attachment nozzle, with the vacuum on a low setting. When the painting is unstretched and on the (clean, paper-covered) floor, as these are, vacuuming can involve a bit of body contortion and a lot of ab muscles to ensure the nozzle and brush reach all areas of the canvas while the motor of the vacuum and our knees do not. Six out of the seven paintings came to the DMA unstretched, and with their original stretchers nowhere to be found. Shiny new stretcher bars were ordered from Simon Liu, Inc. in New York, and it took all of our project interns to assemble six of these massive supports for the paintings. 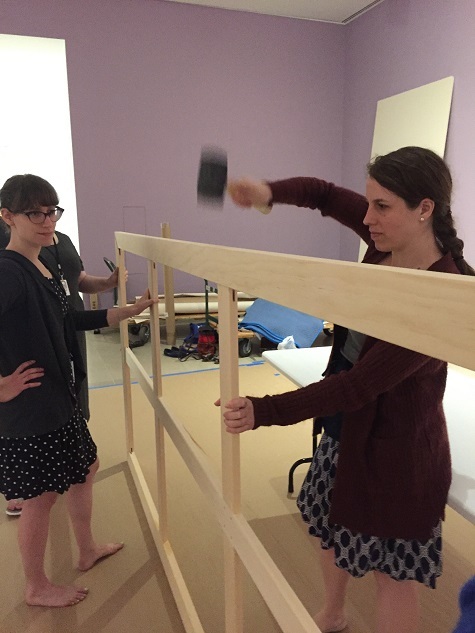 Diana Hartman and Keara Teeter assembling a stretcher. Once the stretchers were assembled, we created what is known as a loose lining. This involves attaching plain cotton-duck fabric to each stretcher, using canvas pliers and arm muscles to make sure each one is taut, and securing each one with staples. 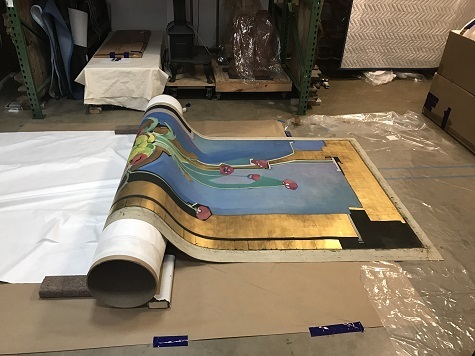 Later in the project, we will stretch Steichen’s paintings over these loose-lined stretchers, and the first layer of cotton-duck fabric will serve as a sort of bed for the paintings. 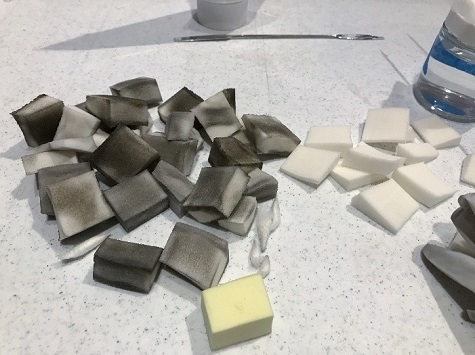 Even though the canvases are in very good condition for being centenarians, they are somewhat weak where they have been folded over stretchers in the past, and the fibers have aged and become more brittle. The loose lining provides support and protection for the original canvas, and ensures that we do not have to pull hard on the original canvases to achieve planarity when they are stretched. 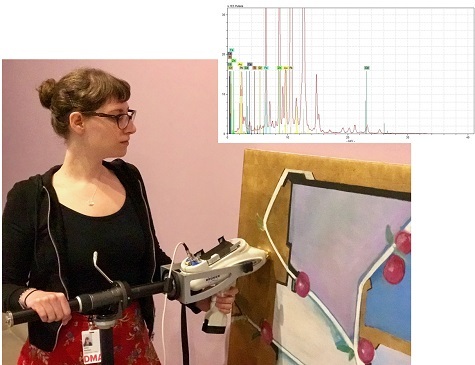 The next steps in our treatment will involve attaching edge linings to the original canvases, stretching the paintings over the loose linings, and performing some analysis with X-Ray Fluorescence in order to determine what elements are present. Stay tuned to learn more about these processes! Pamela Johnson is a Conservation Intern at the DMA. 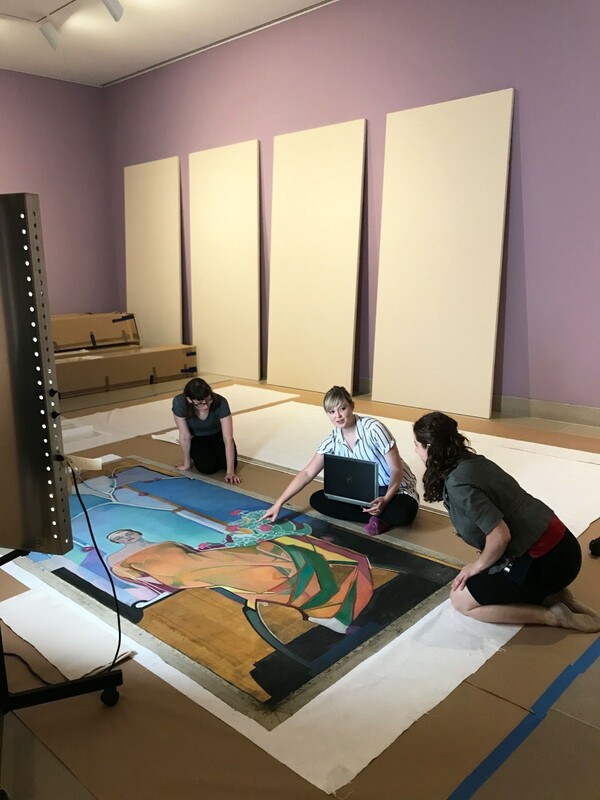 Seven murals painted by Edward Steichen are undergoing conservation treatment this summer in the DMA’s Cindy and Howard Rachofsky Quadrant Gallery. After treatment is completed, the rare and exquisite murals will be on view September 5, 2017, through May 28, 2018, as part of the exhibition Edward Steichen: In Exaltation of Flowers (1910-1914), overseen by the Pauline Gill Sullivan Associate Curator of American Art at the DMA, Sue Canterbury. Edward Steichen, born Eduard Jean Steichen in 1879, was an American artist who was both a painter and photographer during his lifetime. Most of his paintings and photographs were produced for the American art market while he was living in the United States or France. He stayed in Paris for about a year in 1901 and then returned to Paris a second time in 1906; it was then that he joined the New Society of American Artists. One of his friends in Paris was an American student at the Sorbonne named Agnes Ernst, and she later played a large role in Steichen’s commission for In Exaltation of Flowers. In 1908, Steichen moved from Paris to his villa, L’Oiseu Bleu, in Voulangis, France. There, he cultivated a garden and built a small studio with a skylight. In 1910 Agnes Ernst married Eugene Meyer and the couple traveled to L’Oiseu Bleu during their honeymoon. The three friends likely discussed the commission for In Exaltation of Flowers during that visit. 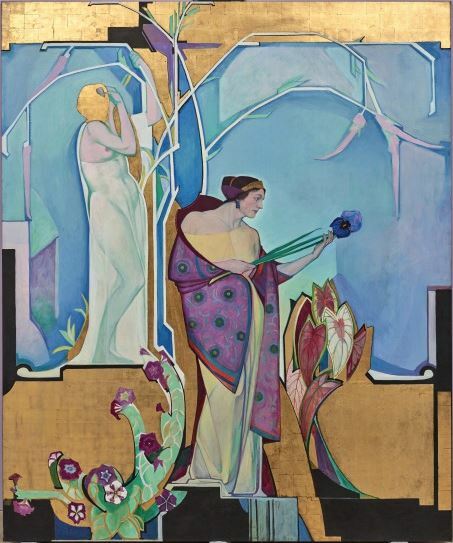 This commission would include seven 10-foot-tall murals designed for a foyer in the Meyers’ new townhouse at 71st Street and Park Avenue, which the Meyers acquired in 1911. The commission was $15,000 and these artworks became Steichen’s most ambitious undertaking. Even before receiving the Meyers’ commission, Steichen had been painting and photographing women and flowers; however, his depiction of the subject matter and use of gold leaf in In Exaltation of Flowers alludes to influences from French couture designer Paul Poiret and Art Nouveau painters Gustav Klimt, Alphonse Mucha, Pierre Bonnard, and Maurice Denis. All seven murals in In Exaltation of Flowers were completed by 1914. Even though they had originally been commissioned for the townhouse on 71st Street and Park Avenue, the paintings were never displayed in that building. 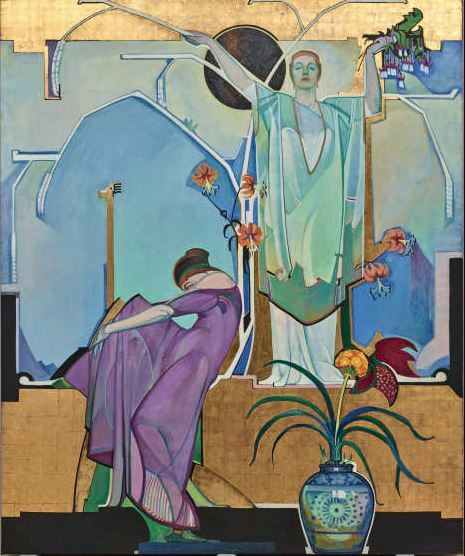 Due to financial hardship, the Meyers had to sell their townhouse earlier in 1914, and Steichen’s intended sequence for the murals remains unknown today. The order listed above is based on a 1915 checklist from their presentation at the Knoedler Galleries in New York. Two of the murals were later displayed at the Pennsylvania Academy in 1921 and 1996, and at least one mural was displayed at the Board of Governors of the Federal Reserve System in 1988. 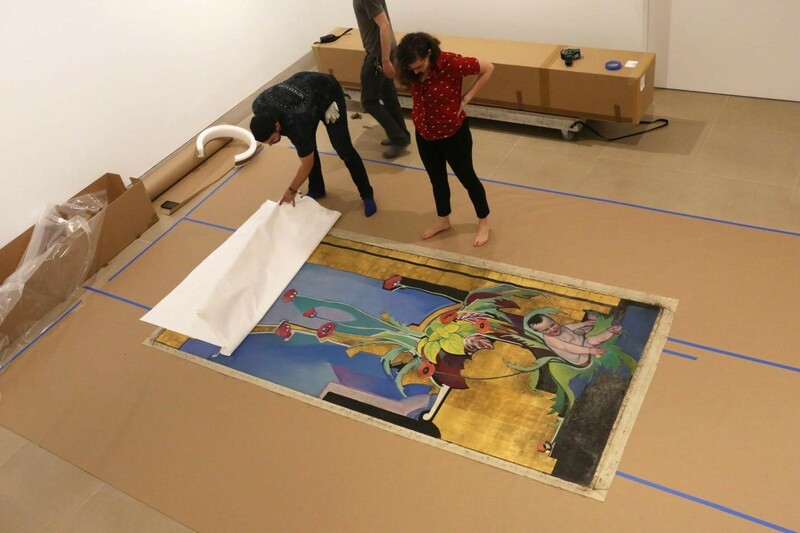 The DMA’s presentation this fall of the murals, which are part of a private collection, will mark the first time the seven panels have been exhibited together since their debut at the Knoedler Galleries 102 years ago. Goley, Mary Anne and Barbara Ann Boese Wolanin. From Tonalism to Modernism: The Paintings of Eduard J. Steichen, October 4–December 9, 1988. Washington, DC: Board of Governors of the Federal Reserve System, 1988. Haskell, Barbara. Edward Steichen. New York: Whitney Museum of American Art, 2000. Pusey, Merlo J. Eugene Meyer. New York: Alfred A. Knopf, 1974. Keara Teeter is a Conservation Intern at the DMA.